Many people wondered why I resigned from the position of Assistant Principal of Wah Yan College Hong Kong at the age of 42 and paid an opportunity cost of about HK15,000,000 to do the non-profit Vocablearning project (www.vocablearning.com) instead of lingering in my original position till retirement. The following figures explained everything. Long hours of private tuition taken by individual students after school, introduction of F1 Bridging Course in summer, Test Week in April and Supplementary Examination in July by the school changed nothing. As an old boy of the school, I have great difficulty in accepting the drastic decline in academic performance of the school in recent years. If the cause of decline was solely due to the decline of the quality of students admitted by the school, probably nothing significant could be done. However, the performance gap as shown in the figures could hardly be explained by this factor. 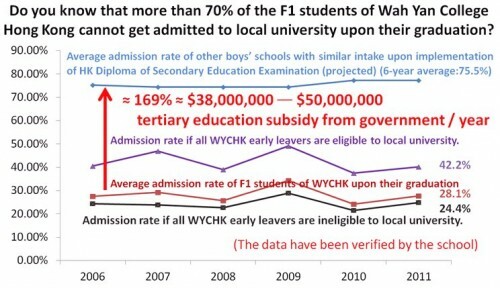 The presence of the gap implies an annual financial loss of at least HK$38,000,000 to the graduates of Wah Yan in term of tertiary education subsidy from the government. If we also consider the earning premium for university graduates, the total loss could be as high as $200m – 300m Note each year, let alone the loss in potential and talent of the young men. And, do you know how many tears are associated with this performance gap in different families of Wahyanites? After years of study, I found this Vocablearning project a possible way to break the impasse. However, the project was still politically infeasible in the school. In order to move the scheme forward, I made a radical decision of resigning from my original position. The after-effect of my resignation eventually broke the impasse. The data gathered in the implementation of last year confirmed my prediction. The project is able to close the performance gap significantly in 6 to 7 years’ time. The evidence was presented to the School Management Committee of the school on 21st Sept 2011. In spite of the fact that the preliminary result of the project was very promising and I am willing to forfeit the copyright of the project to the school, the management of the school informed the students without notifying me that the school decided to abandon the project as a compulsory assignment to students though it only costs each student 10 minutes a day. 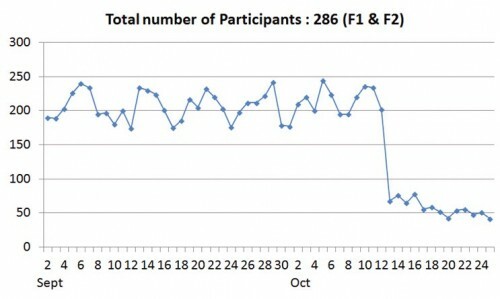 Once the students got informed the decision, the participation rate of the students dropped by over 2/3 overnight and the hope of closing the performance gap vanished immediately. If not all Wahyanites can be helped to perform up to their normal level, they at least deserve the right to know the real situation so that they can make the best possible decision for themselves. Is 200,000,000 greater than 15,000,000 / (60 – 42) OR 200,000,000 > 833,333 ? Note : As earning level is believed to be depending on factors other education level e.g. family background, personal trait, social connection, personal strive, luck etc. A discount factor of 50% has already been included in the estimation based on the statistical figure from the thesis of “Shrinking Earning Premium For University Graduate“, otherwise the figure can be as high as $600m/year.